You’ve been driving down the highway and obeying the flaggers for weeks now. You’ve seen graders, dump trucks and all manner of big equipment moving tons of dirt and debris. They’re obviously busy doing something. But what? Wonder no more; Transportation ProjectsBC has what you’re looking for. The Transportation ProjectsBC home page, your gateway to project information. 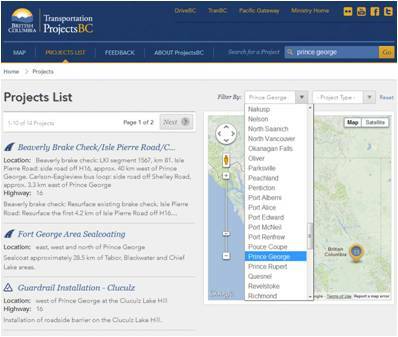 Transportation ProjectsBC is a great tool designed to keep people informed about the projects we’re working on, whether it’s in their local community or across the province. 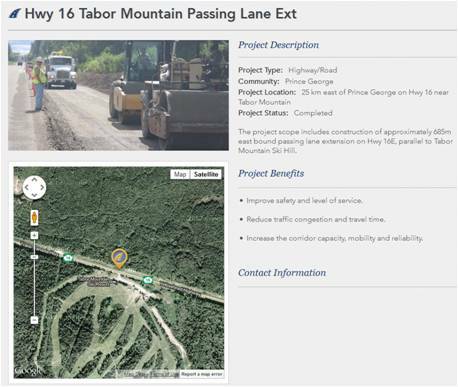 If you’re familiar with DriveBC, you’ll notice this site has a similar look and feel, which helps us provide lots of information while keeping the site clean and easy to use. Wondering what’s happening in your community? Easy. From the home page, just click on “View The Full Project List” button. You’ll see the map view change as it populates with pins showing all the projects. You’ll also see two new filter options appear above the map – “Community” and “Project Type”. So what about that “Project Type” filter? Well, if you just want to see where we’re building bridges, doing highway work or improving transit, you can narrow down based on those options as well. If we switch our gaze over to Castlegar, for example, you’ll notice we’ve done two different types: Road/Highway and Safety projects, represented by the Castlegar Area Sideroad Resurfacing and the Highway 22 Minto Intersection Improvements. Of course, if you’re really keen, (and who isn’t?) you can forget about all that filtering and just click go. It makes for some fantastic reading. You can find out a lot of details here, including what the project’s about, the benefits it’ll bring, how much it will cost and when it should be finished. And if you want more, there’s a contact you can call to ask your questions. Best of all, the site was designed with mobile in mind, so you can get your info on the go. We’ve included projects from 2009 at the moment, updating regularly as they are awarded, so there will always be something new to look at. While you’re on the site, be sure to click the Feedback link, let us know what you think and if there are areas we can improve. We’d love to hear from you. Hi lm a long haul driver and am wondering why the lines arent being painted . Pretty dangerous out there.Especily on a wet rainy night. Thanks for letting us know of your concerns. Your safety is always our first priority. Our annual line marking program is already up and running across the province, aimed at repainting line markings along all of those thousands of kilometres of road which were scraped and salted and sanded away over winter. Is there an area in particular you are concerned about? We can share your concern with the area manager to make sure they know.